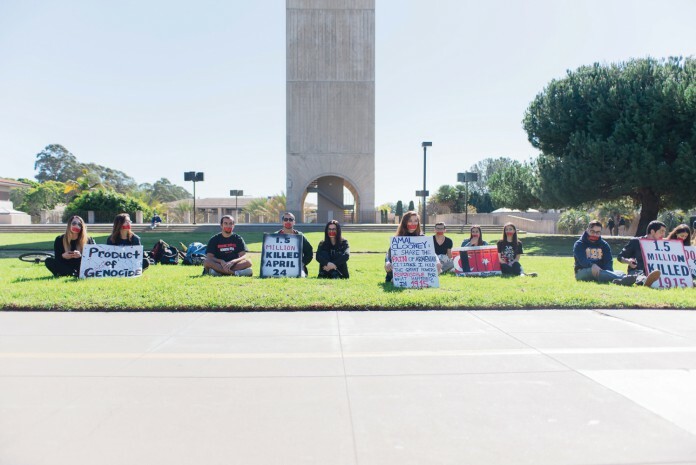 The Armenian Student Association (ASA) held a silent protest on Storke Lawn this past Thurs., Feb. 4, as a part of a multi-state, university wide movement to spread continued awareness of the Armenian genocide that occurred a century ago. In the noontime bustle, over a dozen of University of California, Santa Barbara’s ASA members and allies gathered with informational fliers, colorful posters and red tape across their mouths to symbolize the millions of lives silenced in a hundred year old genocide that remains unrecognized by the nation at fault. For skeptics who argue that it’s time to move on, ASA is demonstrating that even on a university campus, a hundred years and thousands of miles removed from Turkey and Armenia, the legacy of a historical tragedy — the death of 1.5 million Armenians and the dispersion of thousands more at the hands of Turkey — is still crucially relevant today. The fear of history repeating itself, especially in the midst of what is potentially a landmark election this upcoming November, is at the forefront of ASA’s movement to ensure that the millions of lives lost are not forgotten. Entitled “Stain of Denial,” in reference to Turkey’s persistent refusal to recognize their fault in the genocide, the demonstration was also aimed at meeting the organization’s cross-campus objectives in emphasizing the history of the Armenian Genocide, its consequences and current effects on Armenians, and current student action for recognition and reparations. The response to the silent line of students gathered was one of quiet reverence, as passersby paused to read posters and dozens more slowed to pick up informational fliers. Fellow protester and third year philosophy major Melanie Moradi made her mark on the conversation as she explained, her words, like Muradyan’s, muffled behind red tape, the importance of keeping the conversation going throughout the year. As the official anniversary of the Armenian genocide approaches on Apr. 24, Moradi, Muradyan, and their fellow ASA members are planning a week of commemorative events leading up to the date. Events like those seen in past years, including lectures, movie screenings and a candlelit vigil — which, according to Muradyan, attracted over 300 people from UCSB and the greater Santa Barbara community — are in the works for this year. ASA members encourage all who are interested to join them on Apr. 24 for a community wide march in front of the Turkish Consulate in Los Angeles.